Goomby and Foomby, also known as the Goombada Twins, are a pair of Goomba Troopas in Monster Mix-Up. The two of them serve some sort of leader role in Bowser's army. Mario, Toad, and the Mushroom King accidentally encounter them while chasing after Luigi, who had been captured by a Soopa Koopa Paratroopa. Mario recognizes the two of them after a nameless Goomba Troopa warns the leaders of Mario's presence. Mario assumes that, by incapacitating them first, the troops under them might surrender. He charges towards the army and comes back juggling the two twins along with two Goombombs, although he does not know which ones are the twins. The reader must then solve a puzzle to determine which ones are Goomby and Foomby. 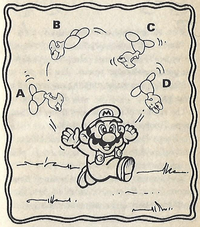 If the reader correctly picks the twins, Mario tosses away the Goombombs and knocks out Goomby and Foomby, although the Mushroom King is then kidnapped by their lackeys. If he does not pick them, the Goombombs blow up, leaving Mario, Toad, and the king by themselves. This page was last edited on March 26, 2018, at 17:13.